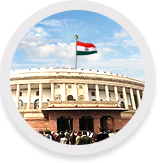 Parliament is the supreme legislative body of India. The Indian Parliament comprises of the President and the two Houses - Rajya Sabha (Council of States) and Lok Sabha (House of the People). The President has the power to summon and prorogue either House of Parliament or to dissolve Lok Sabha. The Constitution of India came into force on January 26, 1950. The first general elections under the new Constitution were held during the year 1951-52 and the first elected Parliament came into existence in April, 1952, the Second Lok Sabha in April, 1957, the Third Lok Sabha in April, 1962, the Fourth Lok Sabha in March, 1967, the Fifth Lok Sabha in March, 1971, the Sixth Lok Sabha in March, 1977, the Seventh Lok Sabha in January, 1980, the Eighth Lok Sabha in December, 1984, the Ninth Lok Sabha in December, 1989, the Tenth Lok Sabha in June, 1991, the Eleventh Lok Sabha in May, 1996, the Twelfth Lok Sabha in March, 1998, Thirteenth Lok Sabha in October, 1999, Fourteenth Lok Sabha in May, 2004 and Fifteenth Lok Sabha in April, 2009.